The FDA recently published a draft guidance for industry on the “Advancement of Emerging Technology Applications”. The draft guidance provides recommendations to pharmaceutical companies interested in participating in a program involving the submission of CMC information containing emerging manufacturing (including testing, packaging and labeling, and quality control) technology to FDA. Find out more about the draft guidance for industry “Advancement of Emerging Technology Applications to Modernize the Pharmaceutical Manufacturing Base“..
On December 23, 2015, the FDA published a draft guidance for industry “Advancement of Emerging Technology Applications to Modernize the Pharmaceutical Manufacturing Base“. Comments and suggestions regarding this draft document should be submitted within 60 days of publication. The draft guidance provides recommendations to pharmaceutical companies interested in participating in a program involving the submission of CMC (chemistry, manufacturing, and controls) information containing emerging manufacturing (including testing, packaging and labeling operations, and quality control) technology to FDA. The program is open for new drug applications (INDs), original or supplemental new drug application (NDA), abbreviated new drug application (ANDA), or biologic license application (BLA). It only affects the quality section of a submission (CMC and facility-related information). The development of emerging manufacturing technology, like, for example, aseptic manufacturing facilities with highly automated systems and isolators, may lead to improved manufacturing, and therefore improved product quality and availability throughout a product´s lifecycle. Pharmaceutical companies can submit questions and proposals about the use of these technologies to a group within CDER (Emerging Technology Team – ETT). The draft guidance is a follow-on to the FDA guidance for industry “PAT – A Framework for Innovative Pharmaceutical Development, Manufacturing, and Quality Assurance” which describes the concept that quality cannot be tested into products. It should be built-in or should be present by design. Through the ETT, FDA intends to encourage the adoption of innovative approaches by leveraging existing resources of FDA to facilitate regulatory reviews of submissions. The request should generally not exceed five pages and FDA expects to notify companies of its decision regarding acceptance into the program within 60 days of receipt of the request. Once accepted into the program, the participant can engage with ETT and CMC in accordance with existing meeting procedures and guidances (e.g. above mentioned FDA guidance on Formal Meetings). For further information, please find all the details in the draft guidance “Advancement of Emerging Technology Applications to Modernize the Pharmaceutical Manufacturing Base“. In our News entitled “Statistics and Process Validation: current Findings of the FDA“, we pointed out that the FDA has been observing more and more deficiencies in the area of statistics with regard to process validation. 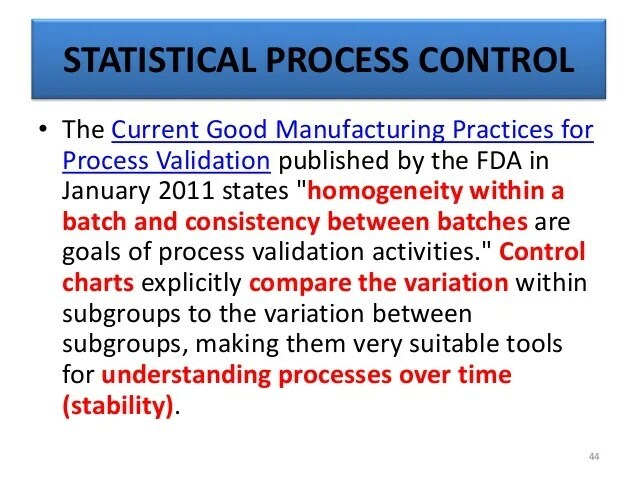 One of the “statistical methods” – also stated in FDA’s Process Validation Guidance – is the use of control charts in the context of a statistical process control (SPC). A SPC can be a valuable resource, particularly in stage 3 of the process validation lifecycle (continued/ongoing process verification). During an event with the Product Quality Research Institute (PQRI), Dr Daniel Peng from CDER’s Office of Processes and Facilities (OPF) presented his views on the use of SPC under the heading “Using Control Charts to Evaluate Process Variability”. He began with the history of control charts and their fields of application. He furthermore considered the most important rules to create and manage control charts, including types of control charts, sampling and evaluation rules according to the Western Electric Rules. He concluded his presentation with examples of control charts for evaluating intra and inter-batch variabilities and site performance monitoring. The slides of the presentation “Using Control Charts to Evaluate Process Variability” are very easy to read and available for free. Are you interested in SPC and control charts? On 18/19 February, the ECA organises the Education Course “Statistical Process Control – A key tool for process understanding in the process validation life cycle” in Heidelberg, Germany. The “new” FDA’s process validation guideline has been effective since January 2011. 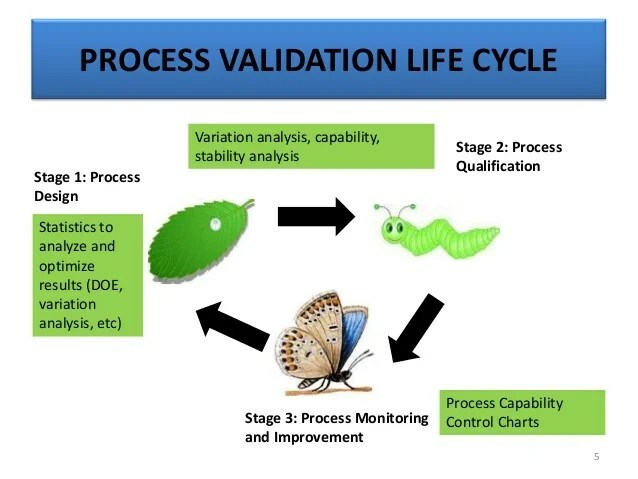 One considerable change was made to the original validation guideline from 1987 to put a significantly greater emphasis on statistics in the context of process validation. So far, relatively few inspection deficiencies had been observed by the FDA with regard to statistics. At a conference in September 2015 co-sponsored by the FDA, Grace McNally – Senior FDA official – reported about current “findings” in the 483s deficiency reports and in Establishment Inspection Reports (EIR). Now, deficiencies regarding statistical problematics can also be found here. For example, it has been criticised that a (statistical) sampling plan had be misinterpreted. Wrong AQL values with regard to the number of samples have been noted based on MIL-STD-105D. Moreover, it has been criticised that the company didn’t know the operation characteristics of its sampling plan. Another criticised “finding” was that PPQ batches had been considered as “accepted” when all in-process controls and release specifications were met. It has also been criticised that no intra-batch variabilities have been examined. In addition, it has been noticed that there was no information available in the validation plan concerning the assessment of the process itself. There was also no indication about the objective of the determination of inter-batch variabilities. Although OOS results had been found in 2 out of 4 PPQ batches, reduced IPC tests have been recommended in the PPQ report giving the justification that this was a standard procedure. Regarding this point, the FDA criticises the lack of scientific rationales for reduced sampling and monitoring. Interestingly, Grace McNally mentions possibilities for rationales of IPC sampling plans and the adaptation to a reduced size. In this context, she refers to the ANSI/ASQ Z1.4 norm and ISO 2859 whereby it is expressly pointed out that the ANSI norm recommends the production of at least 10 successful batches before reducing testing. According to the ISO norm even 15 successful batches are necessary. The FDA notified a tablet process, criticising the fact that no rationales for warning and action limits were available. Furthermore, it has been criticised that no analyses on variabilities were available although they had been required internally and no capacity indices had been determined. There have been no analyses on the distribution of data, neither planned nor performed. The FDA also remarked that the calculation of variabilities is necessary to be able to make statements about process capacities. Conclusion: Reinforcing the emphasis on statistics in the US FDA Process Validation Guideline from 2011 hasn’t been really often addressed in the official deficiencies reports. This seems to be changing. The Variations Regulation (EC) no. 1234/2008 of the European Commission defines the procedure for variations of existing marketing authorisations. The “detailed guidelines for the various categories of variations“, which were published in the consolidated version in August 2013 in the European Official Journal, explain the interpretation and application of this Variations Regulation. Although the “detailed guidelines” describe a number of scenarios of possible variations in some detail, there are formulations in the Guideline text which require clarification due to their blur. The EMA adopted such a case in a recent update of itsquestions and answers collection “Quality of Medicines Questions and Answers: Part 1” to concretise the case through a statement. c) Site where any manufacturing operation(s) take place, except batch release, batch control, and secondary packaging, for biological/immunological medicinal products, or for pharmaceutical forms manufactured by complex manufacturing processes. d) The change relates to all other pharmaceutical forms manufactured by complex manufacturing processes . Guideline Change Code B.II.b.1: Complex manufacturing processes are given when the understanding of the relation between quality characteristics of the product and its in vivo efficacy is lacking. This is often the case in innovative medicines such as products of nanomedicine. Guideline Change Code B.II.b.4: Complex manufacturing processes are those which contain one or more sub-steps, where a scale-up can lead to problems. In both scenarios, the approving authority will decide on a case by case basis. If the applicant submits the variation as a Type IB, he must provide a valid justification that the production process is not “complex”. However, in doubt the authority may upgrade the variation to a Type II. Therefore, the EMA recommends that the applicant clarifies the situation with the authority before submitting the variation.